As many children in western nations gear up to return to school in September, children in India have been back in their classrooms since the start of their academic year in July. Returning to classrooms after weeks of getting to roam outside is never easy, but the children in India often welcome the return to daily mini meals, time spent with friends and projects commemorating popular summer holidays within HoPE Learning Centers. 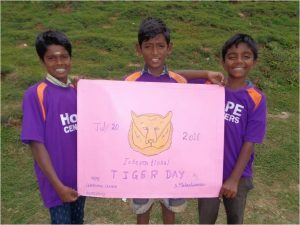 International Tiger Day is very popular with HoPE Center children. They learn exciting facts about the world’s biggest cat, but they also learn how deforestation and poaching due to the demands of underground folk medicine industries cause diminished populations that could lead to its demise. 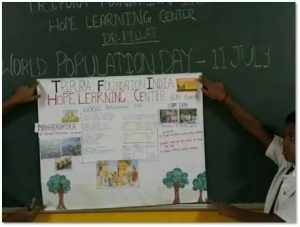 During World Population Day, HoPE Center children are taught about challenges of excessive human population on this planet, but they are also encouraged to propose creative solutions. 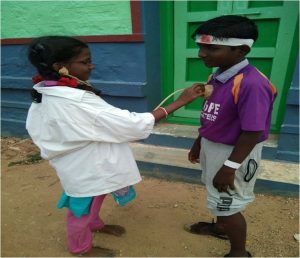 International Doctor’s Day is a holiday when everyone, including HoPE Center children, recognize the contributions of physicians to individual lives and communities. This holiday is especially significant for the children who aspire to become health care providers. 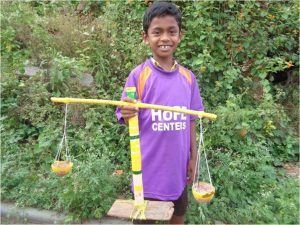 During International Justice Day, HoPE Center children are taught the benefits of justice as well as the lessons of former injustices. Projects that are assigned encourage them to utilize critical thinking to ascertain what is just and what is not. Against great challenges, HoPE kids survive and learn valuable world-wide lessons that will help them to help others around them for years to come. Your generous contributions to HoPE Learning Centers make this possible. A monthly contribution of only $10 covers all expenses for one precious child. A monthly gift of $350 or a one-time donation of $4,200 helps 40 children learn, grow and thrive!